FROM THE AUSTRALIAN OPEN, January 18: The young Aussie Alex de Minaur is rising very fast. He has a long way to go, but he is very quick, on the top of the ball, and then he explodes. He has won seven matches in a row. He lives in Spain, half of the year, when he isn’t on the road. Before, he had to learn how to play. He is 19 years olds and he has watched Rafa Nadal on TV. Now, he can see him a lot in person. He just won Sydney and here at the Australian Open in the second round, he won a five-setter over Henri Laaksonen. De Minaur said he has admired the 17-time Grand Slam champ Nadal has admired him for a long time. They will face each other Friday night. De Minaur moved to Europe when he was just 5 year old. 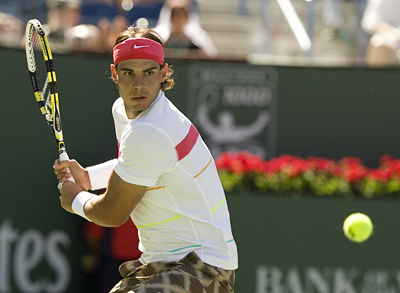 His mother grew up in Spain, so when she saw that her son loved tennis, it was a good idea to go there, to learn. That is the same thing in Australia: so many people are hooked on tennis, and there are a lot of fine coaches, so it is fine to split it up, in different counties. De Minaur did watch Nadal win the Australian Open, in 2009 — 10 years ago. That has been a long time ago, but it is pretty fresh. At least when they face off.